Donal Skehan’s one-pan recipe, from his book Eat. Live. Go: Fresh Food Fast, is best served straight to the table – removing the lid at the table to reveal the delicious steaming meal underneath. Slice the fillet in half and roll both halves in the five-spice powder until completely coated. Place a large frying pan over a medium heat and add the oil. Fry the pork fillets for 16-18 minutes or until it has a good colour on all sides (if you have a meat thermometer the internal temperature should be 65°C). Remove the pork and place on a plate to rest. Using the oil left in the pan, fry the ginger, garlic and the chilli for 2 minutes. Add in the rice wine, oyster sauce, sugar and 150ml boiling water. Simmer gently for 3-4 minutes until slightly reduced. 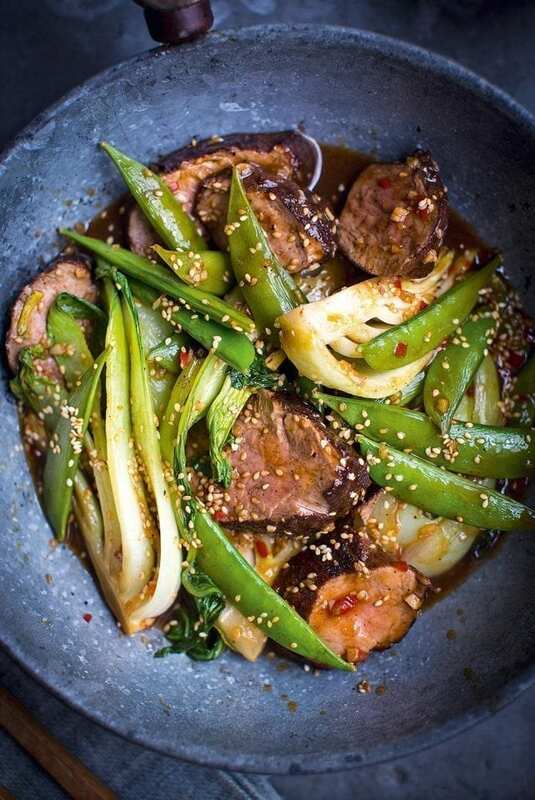 Return the pork to the pan, place the pak choy and sugar snap peas around it and cover with a lid. Cook over a medium heat for 4 minutes until the vegetables are tender. Before serving, remove the pork from the pan, slice it into medallions and nudge it back into the centre of the pan, spooning over the sauce to coat. Serve the whole pan straight to the table with a sprinkle of toasted sesame seeds.